New Orleans is famous for the Mardi Gras parades, but do you know that we also have New Orleans Easter Parades too? Find your white shoes and your seersucker suits because Easter is here and for many it designates the day that is fashionably correct to wear white again. There will be barbecues all over town, Easter Egg Hunts in backyards, and there will also be Easter Parades. 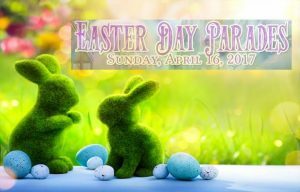 On Sunday, April 16, 2017, there will be at least three parades starting at 9:30am with the Historic French Quarter Easter Parade followed by Chris Owens Easter Day Parade and then the Gay Easter Day Parade. The Historic French Quarter Easter Parade begins at 9:30 a.m. Easter Sunday, April 16th, 2017, at Antoine’s Restaurant in the historic French Quarter at 713 Rue St. Louis, New Orleans, Louisiana. The parade stops for 11:00 a.m. mass at St. Louis Cathedral before promenading through Jackson Square. The parade continues through the French Quarter, returning to Antoine’s Restaurant. The parade will begin at the corner of St. Louis and Royal at 1pm on Sunday, April 16, 2017, continue down Royal to Canal to St. Phillip Street and conclude on St. Louis and Royal at the Omni Royal Orleans Hotel. The parade will be complete with colorful floats, marching bands, beads, Easter trinkets, and plenty of eager revelers. As the Grand Duchess of the Easter Parade, Chris Owens will be dressed in her personally designed Easter ensemble, complimented by her beautiful and exotic Easter bonnet. The parade showcases the fashion and creativity of the entire LGBT community with gentlemen in summer suits/tux with hats, and ladies in Easter suits/dresses with Easter hats from Rampart Street entrance to Armstrong Park. The parade starts at 4:30pm, April 16th, 2017, and benefits Food For Friends Kitchen. The Gay Easter Parade takes a leisurely route through the French Quarter showcasing their Easter designs. The paraders ride horse-drawn carriages or floats while wearing showy versions of their Easter Sunday finest. We hope that you have a wonderful Easter Weekend and if you have a chance stop by Mulate’s and try one of our Famous Cajun Bloody Mary Drinks.